There’s no greasy chain to adjust on a shaft-driven bike. But there is regular maintanence. If you don’t do it, you’re liable to destroy the seals and gears spinning inside. The replacement cost will make you wish your bike had a chain. That’s why changing the final drive oil on a regular basis is key. Many people recommend it be done at 6,000-mile intervals — or about every time you change your motor oil. Getting final drive oil into the pan requires ingenuity and good scotch. Fortunately, it’s even easier than changing your oil. First, gather your tools. You’ll need a torque wrench and a 6mm allen wrench for the filler plug, located on top of the rear hub. A 19mm socket fits the drain plug below it. 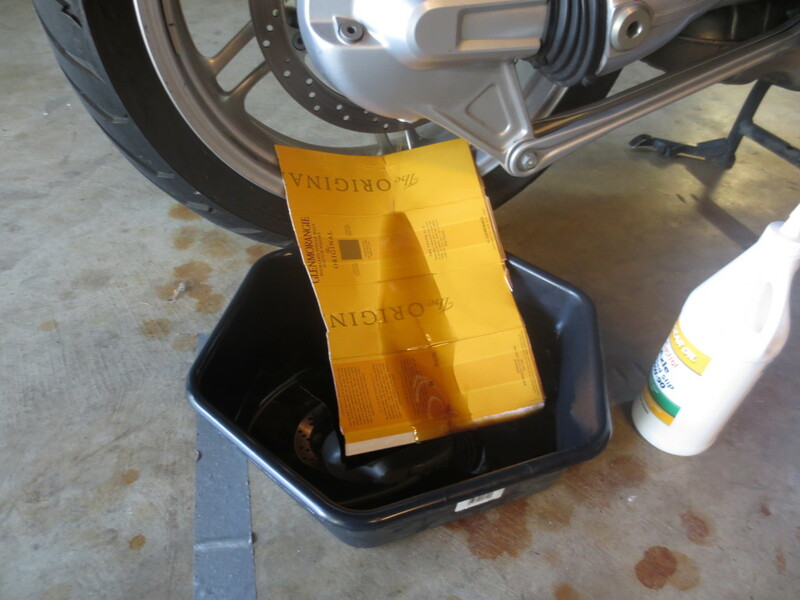 Get a drain pan and cut a piece of cardboard or other material to keep the oil from draining onto your rear wheel. Also, you’ll need a small funnel and possibly a measuring cup. Final drive drain plug is attractive, literally. For oil, almost any GL-5 rated gear oil in the 75-90 weight will do. I am using Castrol 80-90, non-synthetic gear oil ($6.99 per quart at Kragen). Also, you must have two new crush washers. They are about 50 cents each at the dealer. 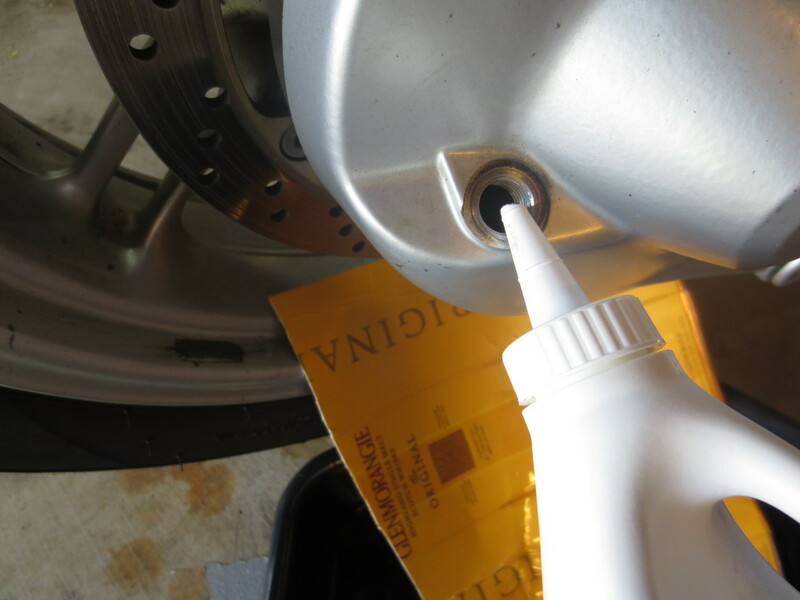 Start by positioning the drain pan under the drain plug with the cardboard chute in place. Remove the filler plug first. 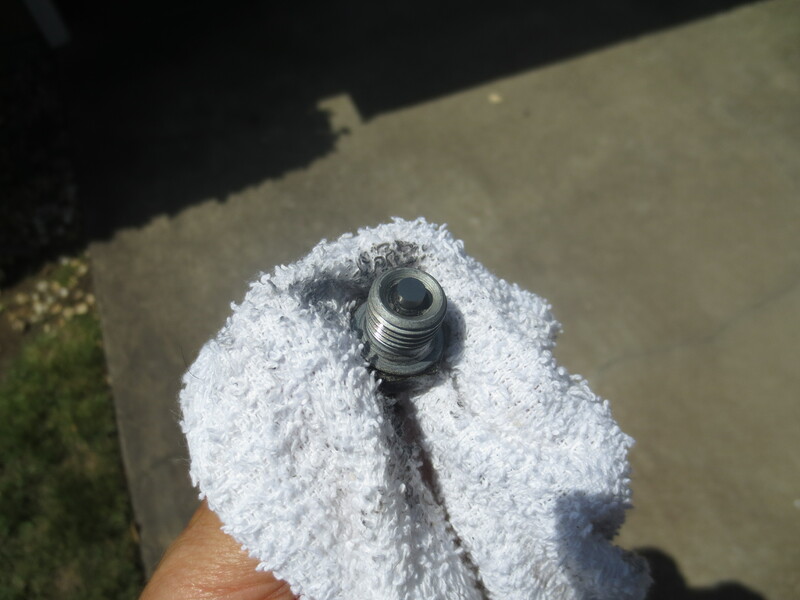 Then unscrew the drain plug and let the oil flow out. Inspect the plug. It has a magnet on it to catch metalic debris and keep stuff out of the works. If there’s a lot of metal on your plug, start saving for a new final drive. Clean it off, put a new crush washer on it and screw it back in by hand. Torque it to about 17 foot-pounds. Fill the final drive with fresh oil. It takes 230 ml or about 8 ounces. You may need a separate measuring cup if the oil bottle doesn’t have markings on the side. Castrol gear oil has a narrow tipped end that is perfect for getting the oil into the small filler hole. Once you’ve filled it, put the filler plug in with a new crush washer. Tighten to 17 foot-pounds also. Dump the used oil in with the other stuff you’re recycling. I put it all in one-gallon iced tea jugs from Trader Joe’s. I like them because they are clear and have wide openings.